This faith-based license plate publicly expresses your belief and loyalty to God. It is your expression of your religious freedom. It encourages others to believe in Him. The $25 you pay when you purchase and renew the plate is also part of your religious expression. It supports this private faith-based organization, not the state. People buy the In God We Trust specialty plate as an exercise of their religious beliefs, not to support a government or state entity. The Federal District Court, Middle District of Florida, has ruled the purchase of any Florida specialty license plate is an exercise of the purchaser's first amendment free speech. 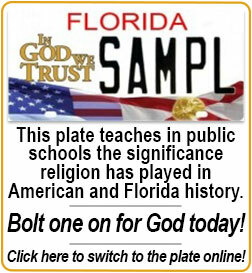 In the case of the In God We Trust plate it also is an exercise of your religious belief, as protected by the Florida and federal constitutions. Each license delivers $25 per year to the In God We Trust Foundation, Inc (IGWT). Of this, 90% of this is used on program and 10% is used on administration. Administration is the gas that makes the engine run. We are the sponsoring organization which thought up, paid to create, and caused the In God We Trust motor vehicle specialty license plate to be issued in Florida. We are a private 501(c)(3) public purpose charity, which means that donations to us are tax deductible and the bulk of our revenue comes from those donations from the public, not from our own operations. Therefore the $25 portion of your purchase of an In God We Trust specialty license plate is tax deductible. The $25 does not fund the government. Our chief program has put God back in public schools and your plate purchase helps spread that to other public schools. Bolt one on for God today! It is the most important thing you can do. Don't wait for renewal -- just go to your local tag office and say you would like to make an early switch from your current plate to the In God We Trust specialty plate. There are some fees for early swapping, but teaching God in school again is worth it. Each plate on the road spreads His name and makes it easier for more people to join Him.